Are The Jobs Numbers Fake Now? When similar results were posted in past employment data, Trump was dismissive and calling them lies. Now that the first labor report of his nascent presidency has been released, he is changing his tune. Trump officials are now openly touting the numbers as evidence that they are facilitating change. In reality, it is not much different than what we have seen over the last year. There was an increase of 235,000 jobs and a modest decrease of the unemployment rate is 4.7 percent. Certainly, this is a positive development, but we should also recognize that there were 2,000 more jobs created at this time last year. Having said that, Trump should receive some credit for the upbeat news. His promise to introduce more business-friendly legislation is being warmly received by business leaders and that’s reflected in bulging stock markets. Also, his efforts to reduce environmental oversight has already reaped benefits in manufacturing. After a long period of stagnant growth, there have been 57,000 jobs added in the past three months with almost half of that total occurring in February. On the other hand, there hasn’t been demonstrative change in other employment factors. The labor force participation rate has changed little from 63.0 percent from 62.9 percent last year. Also, the employment-population ratio edged up slightly from 59.8 percent to 60 percent. An alternative measure of unemployment accounting for those only marginally attached to the labor force dropped to 9.2 percent. While continuing a long-running downward trend, its rate was matched as recently as last December. As for wage growth, it continues to fall short of the three percent threshold that’s been illusive in recent history. In fact, we haven’t reached that growth level in almost six years. Currently, wages have grown by 2.5 percent over the past twelve months. While that’s better than last month, the average wage growth for the first two months of this year (2.3 percent) is slightly behind last year’s pace of 2.4 percent. Until Trump passes a legislative agenda that reflects changes to taxes and regulation, it is unfair to judge his record, regardless of whether the future economy expands or contracts over the next few months. Let’s wait until this time next year where we can then more accurately measure his economic stewardship as commander-in-chief. In summary, the employment picture is brightening, but that trend started long before the inauguration of Trump last November. It is more accurate to say that he effectively crafted a misleadingly gloomy view of employment prospects that elevated him to an improbable victory. 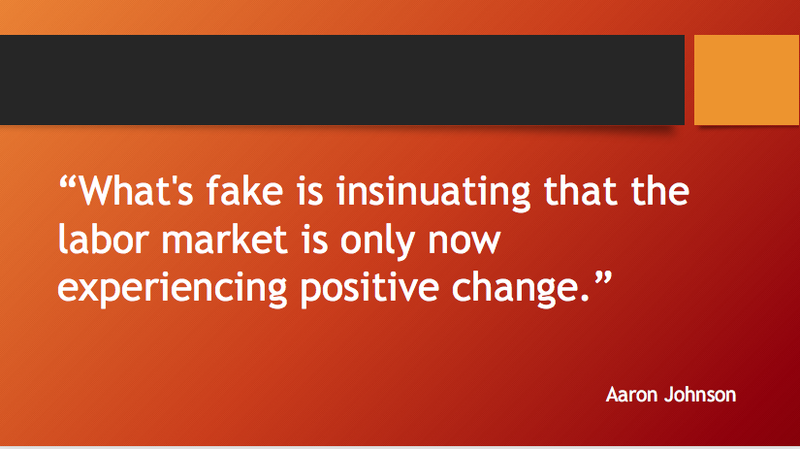 What’s fake is insinuating that the labor market is only now experiencing positive change. With the deadline on filing taxes ending recently, this is an ideal time to spend our tax refund the right way. With all of the hard work that we put in each day, it is time to reward ourselves. Rather than thinking about purchasing the latest iPhone, big-screen HDTV, and a luxurious vacation, reward yourself with less stress by boosting savings and reducing debt. It is essential to build up an adequate level of savings. Unless you have two months or more of your income in emergency savings, it would be helpful to devote half of your refund in replenishing your safety net. One can never foresee a car breaking down, costly medical surgery that is essential, or losing a job. However, you can prepare for those instances by having an ample amount of saving to alleviate a crisis. Otherwise, you will be tempted to make ends meet by using your credit card, which should be avoided at all costs. In our pursuit of wealth and prosperity. we first need to rid ourselves of the curse of debt. Try to commit at least half of your refund toward eliminating debt. Credit card debt leads us down a path of despair and misery. You have already committed to an austerity budget where you will mostly spend on necessities, rather than spend frivolously on items that are not needed. When eliminating debt, focus on the interest rate, rather than the balance. If you have multiple forms of debt, resist the urge to pay down small balances that have low interest rates when you have large balances with much higher interest rates. Recognize that high interest rates will do more damage to your wealth than low interest rates. Debt reduction means setting mini-goals. If you have $10,000 in debt and earn a low or moderate income, then it is not possible to pay it off within a year. Assume that you earn $40,000 a year. If that is the case, commit to paying off 10% of that debt each year. Depending on the interest rate, it might take up to three years or more to eliminate it. That is a long time and can lead to discouragement. Therefore, set moderate goals that can be met throughout the year. One example is rewarding yourself with a small impulse buy when your debt balance is reduced by $1,000. Discipline yourself through a mindset of delayed gratification. We only live once, so it is fine to splurge on the finer things of life. However, let’s pursue moderation by identifying one item, rather than multiple items. In addition to paying down your debt, set aside extra funds over time toward buying that special outfit or home furnishing or modest vacation over time. By resisting the impulse buy, you have time to pay it with cash rather than debt. Also, by waiting, you might be able to take advantage of special deals and discounts. Stop punishing yourself through satisfying temporary pleasures and seek more permanent rewards through more disciplined money management practices.